The holidays are finally here and it’s time for you to kick back, relax, and enjoy friends and family! For many, celebrating the most wonderful time of the year means gathering with the people you love the most and popping open a bottle of wine. What you might not have considered after a few glasses, when you smile for the camera or catch a quick glance in a mirror, is that your teeth have been stained by a glass of Merlot! As long as there’s wine, the holidays will be fine! We’ve all experienced the stress of the holiday season, and for many of us, our favorite way to bond with family and friends is to share a bottle of wine around a warm fire and the Christmas tree. If red wine is your choice of drink for dinner, parties, and general go-to treat for after everyone heads home, you’ve likely experienced red wine teeth. You probably also know that red wine-stained teeth are tough to remove in a pinch—no amount of brushing right afterwards is going to take away that burgundy film. But before you go switching to beer, white wine (which has a higher acidity level), or water, you may be surprised at how you can keep your red wine affinity. If you have recently undergone a teeth-whitening treatment, we recommend against drinking red wine. Any dark-colored food or drink can lead to dental staining. The rule of thumb here is that if it can stain your clothes, it will stain your teeth. But Eat, Drink, and be Merry! Did you think our only suggestion would be to warn you against drinking red wine? No way! Red wine stains can be avoidable, and there are definitely some preventative measures you can take to ensure you enjoy your red wine and keep your white, dazzling smile. Before you start drinking, make sure that your teeth are squeaky clean! Brush your teeth and floss thoroughly to keep them plaque free. Before you’re drinking wine, brush your teeth about an hour beforehand. Visit your dentist regularly for routine, deep cleanings. On top of your daily dental routine, make sure that you’re not missing those annual dental cleanings either. You want to keep the plaque on your teeth minimal, as the red wine actually sticks to plaque on your teeth. Avoid brushing too soon after drinking red wine. It sounds counterintuitive, but brushing too soon after drinking can actually cause more harm than good. Not only can brushing too close to drinking alter the taste of the wine, but brushing too soon after allows the acidity of the wine to penetrate the pores of your teeth and cause enamel to erode. Sparkling water = your best friend. After a glass of red wine, if you’re already finding stains, don’t panic! Follow it with a glass of sparkling water. The bubbly water will help breakdown the red stain, and you will be hydrating throughout the night. We’re not talking about smiling for the camera here, but this will help you get ready for any pictures. If you’re not a fan of sparkling water, eating cheese is actually your next best way to get rid of wine stains. The calcium in cheese closes micro-pores on your teeth and builds up to block wine stains. Plus, having a reason to hang out next to the cheese ball is totally worth it. Pack a travel toothbrush and toothpaste. Carry a travel toothbrush and toothpaste with you if you’re worried about letting wine stains set in or if you know you’re staying out late for the night after a few glasses of wine. When in doubt, go for lighter wines. Make a toast to the holidays and a new year! 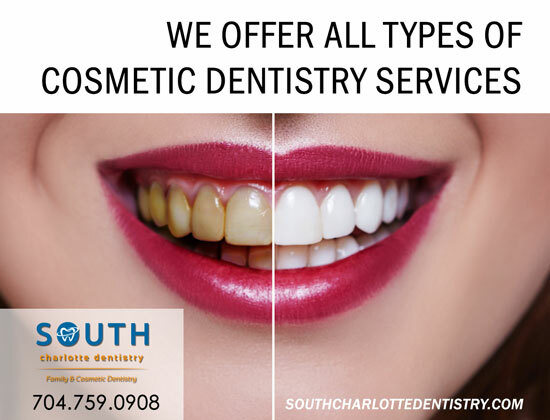 Here at South Charlotte Dentistry, we want to again express our sincerest wishes that you have a safe, happy, and fun holiday season. We look forward to serving you in 2018!